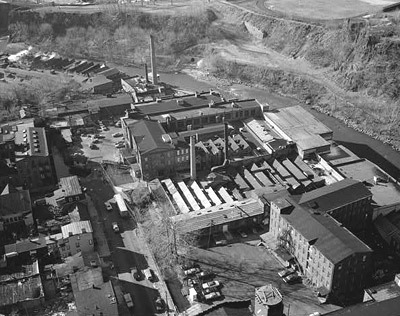 On seven acres below the Great Falls and along the Passaic River, is an area called the Allied Textile Printing (ATP) site, where the Colt Gun Mill was located and where textiles were produced continuously for 200 years. John Ryle produced the nation's first skein of silk here. The Jacquard loom, which was brought to Paterson in the early 1870's, gave a boost to the silk industry. This type of loom enabled the weaving of intricate patterns in fabrics, ribbons, and military ceremonial attire. 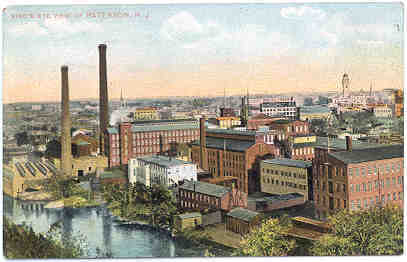 During the late 19th century and early 20th century Paterson was known as the "Silk City" of the world. At that time, approximately 121 firms in Paterson, involved in every facet of manufacturing the silk product, employed thousands of workers in their mills. In February of 1913, 25,000 silk workers went on strike to improve working conditions. After seven months, the workers went back to work, defeated. The ATP site lies at the heart of the Paterson Historic District, encompassing many of the manufacturing establishments that contributed to Paterson's fame as "Silk City." The site is bounded on the north and west by the Passaic River, close to the Great Falls, the highest falls on the East Coast. The south and east borders of the site are marked by the property lines of the Essex and Congdon Mills, respectively. The ATP site contains some of the most important mill buildings of Paterson, ones that are representative of the city's significance in America's growth as an industrial power. With remnants of buildings dating from the 1830s (the Gun Mill), to the 1930s (additions to the Passaic and Todd Mills), to the 1960s (northern portions of the Waverly), the ATP site also exemplifies the history and decline of the textile industry in Paterson and throughout the northeastern United States. While there were other areas of Paterson in which textile manufacturing occurred, the ATP site represents a concentration of such industrial activity. The Passaic River and the S.U.M. raceway system are two of the most important historical assets of the ATP site. The power of the river and its potential for industry played a significant role in Alexander Hamilton's selection of Paterson as the location for the Society for the Establishment of Useful Manufactures in 1791. An elaborate system of raceways, the first attempt with the United States to harness the entire power of a major river, was designed to provide waterpower to the mills. The raceway system today gives some organizational definition to the ATP site; the lower raceway (1827-28) follows the southern boundary of the site, and the location of the original middle raceway west of the Gun Mill (1807) aids in the demarcation of the westernmost boundary of the ATP site. Tailraces exited many of the site's mill complexes into the river. 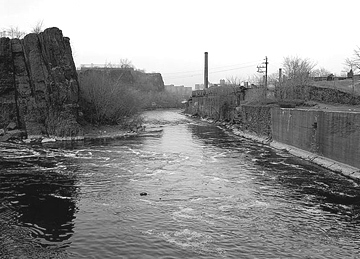 This vital relationship to the water defined the development of the ATP site – and Paterson in general – as a center of industry in early nineteenth-century America. The structures that occupied the ATP site represent a range of forms typical to such enterprises over more than a century. Industrial buildings of the nineteenth century were of frame, brick, or stone construction, with small windows set into their load-bearing walls; in the late nineteenth century, the development of an iron, and then later a steel, structural framing system, and still later the reinforced concrete frame, enabled the use of larger windows by freeing exterior walls of their structural function. The multistoried Gun Mill, erected in 1836 of local stone, is illustrative of early mill design. The Waverly Mill, on the other hand, with its two-story high windows on the east façade and multipaned industrial sash windows in the rear, is indicative of the changes brought by later structural frame systems. By the early twentieth century, the site, which had in the 1840s been populated by only four mills with limited support buildings, had grown to a dense collection of mills, dyehouses, pattern storage structures, machine shops, etc. Compounding the rich congregation of mill buildings from all eras are the distinctive architectural forms that characterized these industries, such as the sawtooth roof for dyehouses, and the brick stacks for boilers. The development of the ATP site was characterized by a complex and rapidly changing occupancy/ownership of the buildings. From its beginning, the buildings constructed at the site have housed numerous enterprises, some lasting only a few years, some for more extensive periods, and others returning years later under a different incorporation. While many of the buildings housed a certain type of manufacture for virtually the entire period of activity, other structures were renovated to accommodate different industrial pursuits. Throughout this expansion, mill owners generally adhered to the organization found in their lot lines. Known as "Silk City," Paterson (and specifically the ATP site at the heart of industrial Paterson) was heavily involved in producing silk, such production reaching its height in the early twentieth century. Within the ATP mill complexes, most production, if not fulfilling some aspect of textile production, directly supported such manufactures through the production of textile machinery. By 1794, when water from the falls was first brought to the district, the first factory had been erected for the purpose of spinning cotton yarn. The expansion of the raceway system in 1807 engendered further textile production (flannel, silk ribbons, woolens, and cotton), as well as mills that produced metal goods such as kettles, spades, pans, and nails. For a few years, the Colt Gun Mill, erected in 1836, produced the famous revolvers, before that company moved to Hartford, Connecticut. A brief enterprise at the Gun Mill involved steam-heating radiator patent and production, and another operation concerned parchment paper machinery. 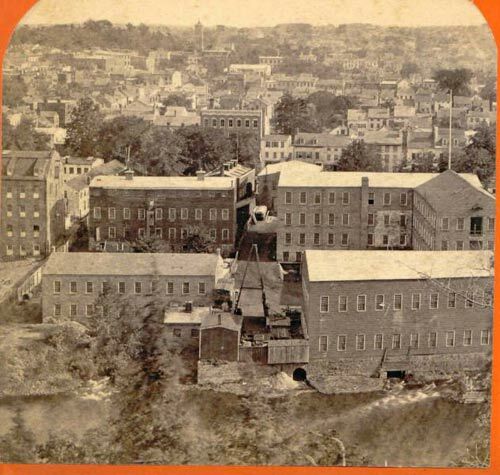 Textile machinery, such as hemp and rope machines, steam engines and boilers, and copper rollers for printing, was manufactured at the Todd and Rafferty Machine Company in the second half of the nineteenth century. The height of production on the ATP site, nevertheless, was related to textile manufacturing: from spinning, throwing, and weaving to dyeing, printing, and finishing (wet processing.) These enterprises, active during Paterson's development and rapid growth, typically were, as the SEA Report points out, small, independent operations focusing on one aspect of textile production or supporting the process by producing machinery. The financial panics and recessions in the late nineteenth century and other major events in Paterson's history left their imprint on these small enterprises. The flood of 1903 caused great damage to the physical plant of many of the mills, and the strikes of 1913 closed down many of the mills, a few of which were still listed as vacant on the 1915 Sanborn map. Beginning in the twentieth century these small operations were consolidated under the auspices of larger manufacturers, such as the Standard Silk Dyeing Company and the Allied Textile Printers (renamed the ATP Processors, Ltd.) The SEA Report observes that between 1938 and the closing of manufacturing operations in 1983, the focus of the production was wet processing of grey goods (woven textiles). The growing popularity of synthetic fabrics such as nylon, acetate, and rayon had a great impact on Paterson and the production of silk in the United States. The ATP site, after its closure in 1983, was purchased by Paterson Renaisaance Partners, which planned to renovate and redevelop the industrial district for commercial and residential uses. In June of 1983, the first of a dozen arson fires ripped through the ATP site, causing immense damage to the original mill buildings. Today, ruins of the mill complexes remain. In 1994, the City of Paterson acquired the site through foreclosure, following Paterson Renaissance Partner's inablility to pay outstanding taxes. The entire site lies within a floodplain. The majority of the site falls in Zone A0, which indicates an area of 100-year shallow flooding, where depths range from one to three feet. According to the city's Master Plan, the site falls within a "Floodway Fringe" zone. The ATP site offers unique and valuable views from the north side of the Passaic River, is also visible from several significant public areas within the city, and provides interesting views of the river. The views from the site are pleasing, as they are of the opposite, wooded shoreline, which is a unique vista, given the urban context of the site.